YOU GOT QUESTIONS, WE GOT AXES. ALSO ANSWERS. 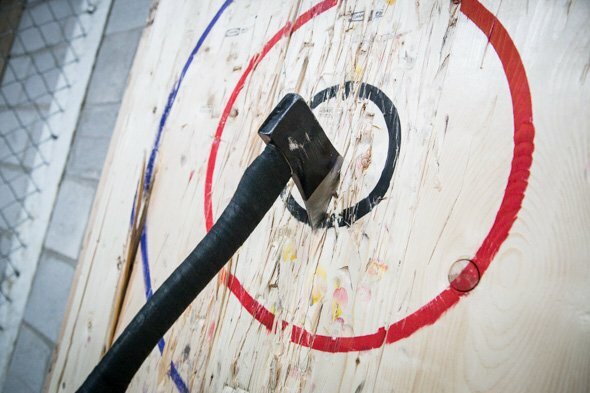 Do you have questions about axe throwing or booking a LumberjAxes tournament with your friends? Take a look below for frequently asked questions. Group events, typically two and half hours, cost $35/person. Walk-in sessions, which are one hour, cost $20/person. You’ll need a credit card. We require a non-refundable deposit at the time of your booking. The remaining balance is paid at the time of the event via credit card. You betcha. Axes, lanes, and targets will be provided by us! Sure you can bring up to two (2) fans... umm spectators with your group free of charge. Any additional spectators after the first two will be charged the full amount of $35/person for a tournament or $20/person for a walk-in session. Can we bring our own food or alcohol? You can bring in your own beer & wine. We enforce a 1 drink per hour per person rule, though! HARD LIQUOR IS NOT PERMITTED. We have menu's on hand for Frank's Pizza & Chicken -- and they deliver fast!! To book corporate or private events outside our normal hours of operation please, or to book groups larger than 24 people, give us a call at 412-408-2650. Any other questions? Email Pittsburgh (Millvale) at millvale@lumberjaxes.com or South Hills (Mt. Lebo) at pghsouth@lumberjaxes.com.